Melaleuca, the "perfect balance of science and nature", brings to Okinawa environmentally sensitive, cost effective products, "Consumer Direct" from the manufacturer. This unique shopping system by the way, is NOT network marketing. Most people have been through enough network marketing, multi-level marketing, telemarketing, & "supermarket-ing" to drive a sane person mad. However, Customer Direct Marketing is unlike any of the aforementioned. The benefits are endless and there’s a 100% unconditional guarantee on everything in the Melaleuca store. On this Friday and Saturday at the Ginowan Convention Center, Melaleuca will officially launch their shopping catalogs and products to Okinawa. Melaleuca and Nicole Miller products will be fully demonstrated, while giving attendants the opportunity to learn about the Melaleuca business and giving them the chance to get in on the business end of it as well. Guest presenters will include Toshiko Hosoya, the Managing Director of Melaleuca Japan; 1999 Marketing Executive of the Year, Laraine Agren; and Melaleuca's International Marketing Manager, Stacie Landon. These women will share their wealth of knowledge and experience with Okinawans and Americans alike during the two-day convention. Laraine Agren will arrive from the U.S. this weekend, eager to share her story and the "business opportunity of a lifetime" with everyone at the convention. She was like many others who have tried it all, from taking odd jobs here and there and selling vegetables from her garden to investing in network marketing companies. In February 1998, she and her husband Ray heard about an opportunity with Melaleuca, and decided to start out by just trying the products and very soon after decided to make a career in Melaleuca. 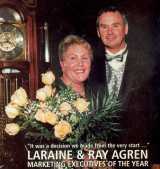 Now after only two and a half years, she has been name Melaleuca's 1999 Marketing Executive of the Year. Laraine says, "The integrity of the company is inspiring. It feels nice to get behind a company that actually stands for something. They do the right thing and just keep making it better, year after year." The Melaleuca/Nicole Miller Okinawa Products Launch Convention will begin this Friday, October 13 at 1930. Saturday's events begin at 1100 and presentations will cover the entire scope of Melaleuca's products and business opportunities. For information on how to get your ticket to the convention, please call George or Chris at (Kadena) 633-0148.